Chef’s notes: If the tortillas seem brittle, heat them in the microwave for 10 seconds to soften them. To bring the eggs to room temperature, place them in a bowl of tepid water for 20 minutes. 1. Preheat the oven to 340°F (170°C). 2. Press the flour tortillas into 4 cups in a standard-size muffin pan. Brush the inside of the tortilla cups with the cannabutter. 3. Divide 3/4 cup (86 g) of the cheddar cheese among the tortilla cups. Top with the chopped bacon. Carefully break an egg into each tortilla cup. Top evenly with the remaining cheese. Sprinkle with salt and black pepper. 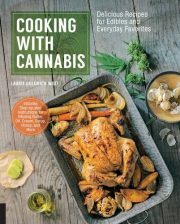 This recipe is featured in “Cooking with Cannabis,” published by Quarry Books, and is available through Amazon.